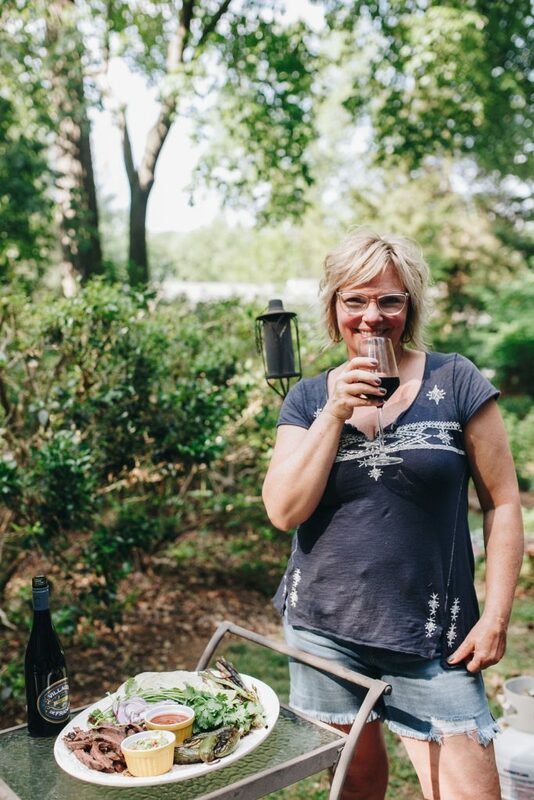 You all know how much I love grilling season! 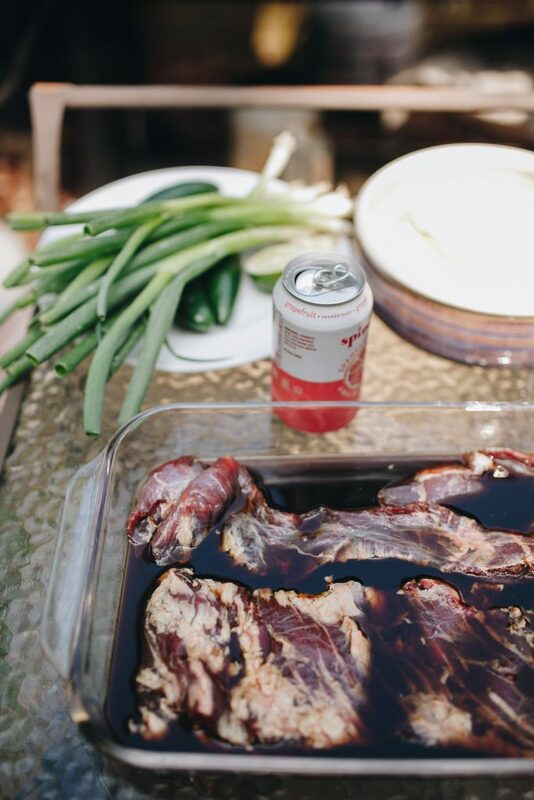 This might be the simplest marinade recipe of all time yet it is so incredibly delicious. 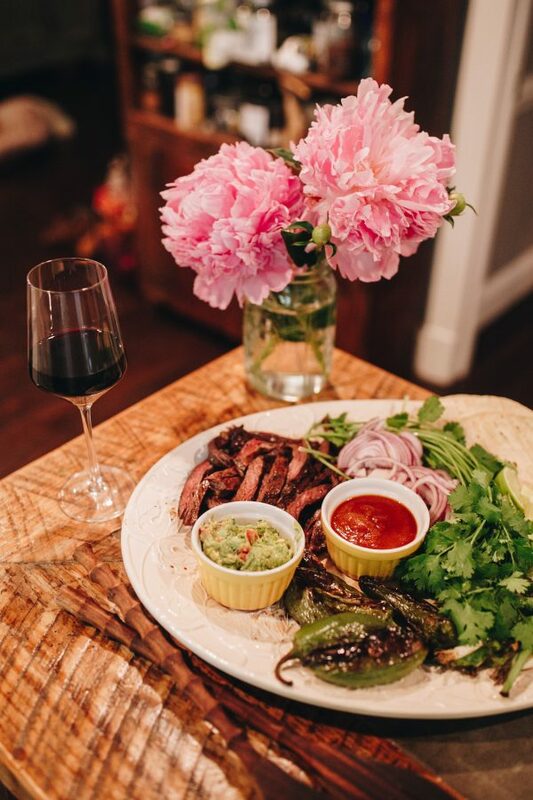 My favorite way to serve this skirt steak is to make a big platter with tortillas, delicious salsa, guacamole, grilled spring onions and jalapenos. Everyone can make their own taco or just eat it smothered in guacamole or my tomato and red chili salsa. The presentation looks rustic and beautiful with the charred veggies and there are options for everyone’s taste. Mexican food is one of my favorite things to make! I just love the fresh flavors especially this time of year when all the veggies are in season. 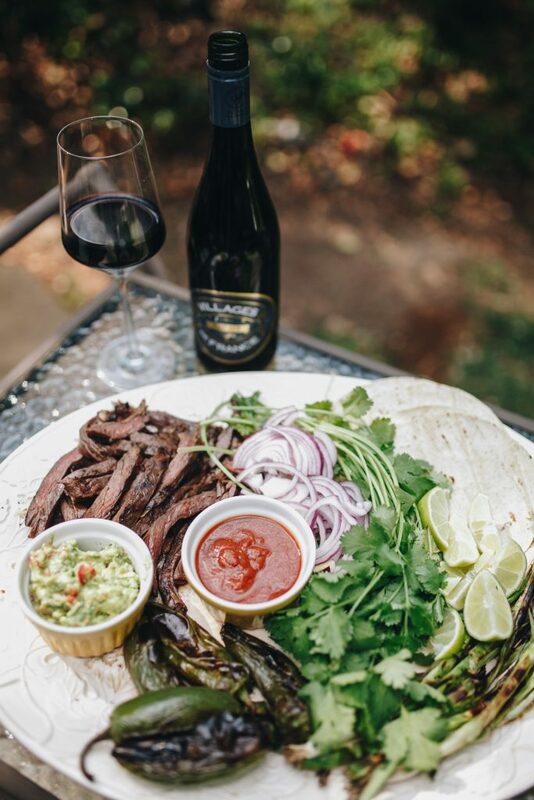 Skirt steak can tend to be a bit tough so a marinade really helps to break down the meat and then with just a quick sear on each side it turns out perfectly. 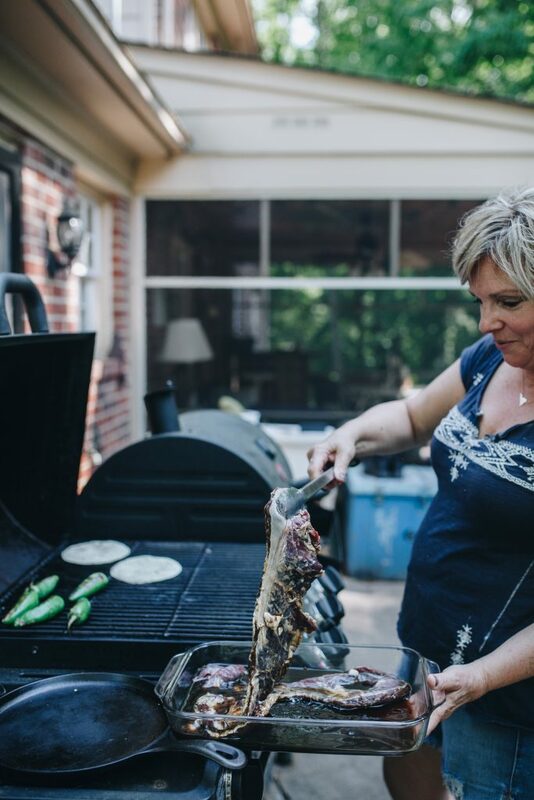 I get my skirt steak from Riven Rock Farms, they have amazing pasture-raised meat that is not ridden with GMOs and their animals are healthy and humanely raised. They have incredibly high standards which means the meat I get from them is out of this world delicious. This marinade is the simplest but shockingly delicious. The original recipe comes from Rio Grande Cafe which is one of our favorite Tex- Mex restaurants in Washington DC. Our friends, David and Jackie were able to obtain their secret and sweetly shared it with us! The pineapple juice has enzymes that not only help to tenderize but also promote a delicious glaze on the outside of the meat when grilled. 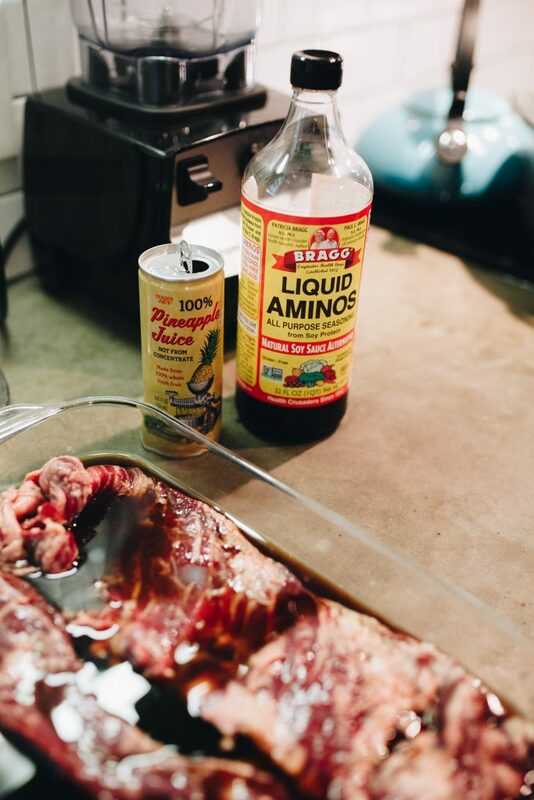 The Bragg’s Amino Acids (or you can use Tamari) also help break down the meat and perfectly salt the steak without adding any additional seasoning. Pour mixture into a freezer bag (or glass dish) and add meat. Massage meat slightly so it is all coated and put in refrigerator for at least 4 hours or overnight. 1. Remove meat from the fridge and let rest on the counter in the bag of marinade for about an hour to come to room temperature. 2. Heat up the gas grill and while that is heating up, remove steak from plastic bag and pat dry with a paper towel. 3. When the grill is hot, sear the steak on one side for 3-5 minutes. 4. Flip over to other side and sear for an additional 3 minutes or until desired doneness. 5. Let rest for 10 minutes and then slice against the grain. 1. 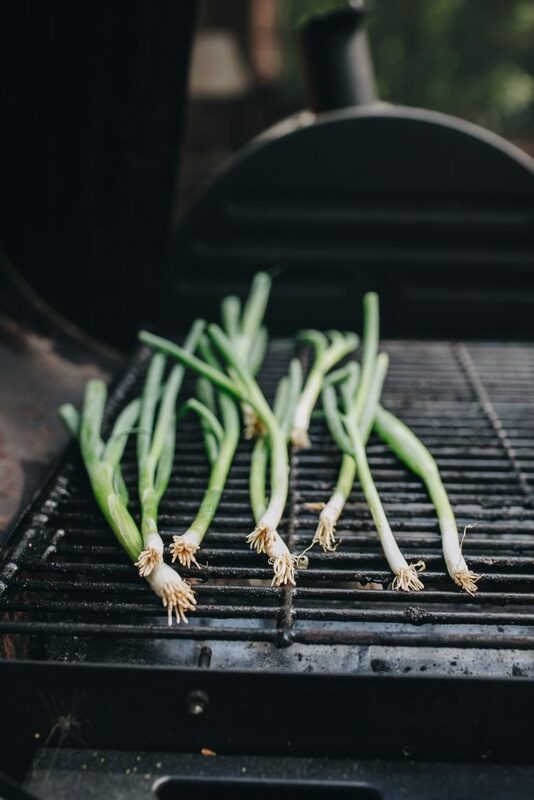 While you are the grilling steak, put spring onions and jalapenos on the grill. Turn them while grilling until you have a char on all sides of the vegetable. 2. 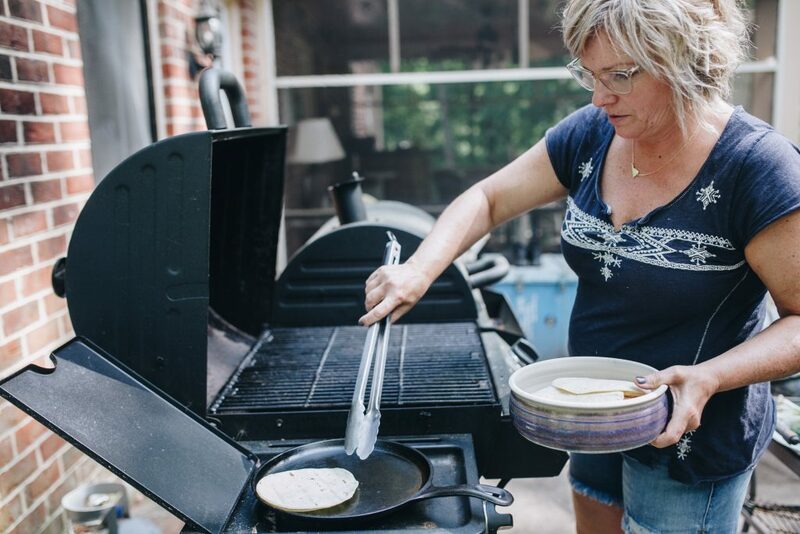 You can also use this time to heat up any tortillas you might want right on the grill. Using tongs just heat each side of the tortilla until desired doneness and place between 2 dishcloths to keep warm. 3. Drape spring onions and charred jalapenos on one corner of the plate. 4. Place sliced skirt steak on the other end of the platter. 5. Fill in the middle with some sliced red onion, cilantro, limes, grilled tortillas, salsa and guacamole. You now have a beautiful presentation for your family or for any event you might be having. I love this platter because you can set it in the middle of the table and everyone can help themselves, family style. I think it makes for a very fun and informal setting but it is the most delicious food. Everyone will thoroughly enjoy themselves! Heat up the gas grill and while that is heating up, remove steak from plastic bag and pat dry with a paper towel. When the grill is hot, sear the steak on one side for 3-5 minutes. Flip over to other side and sear for an additional 3 minutes or until desired doneness. Let rest for 10 minutes and then slice against the grain. 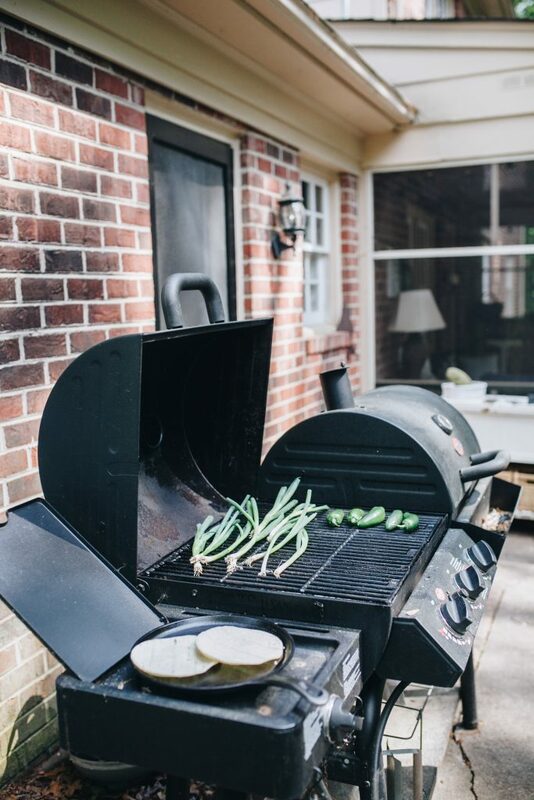 While you are the grilling steak, put spring onions and jalapenos on the grill. Turn them while grilling until you have a char on all sides of the vegetable. 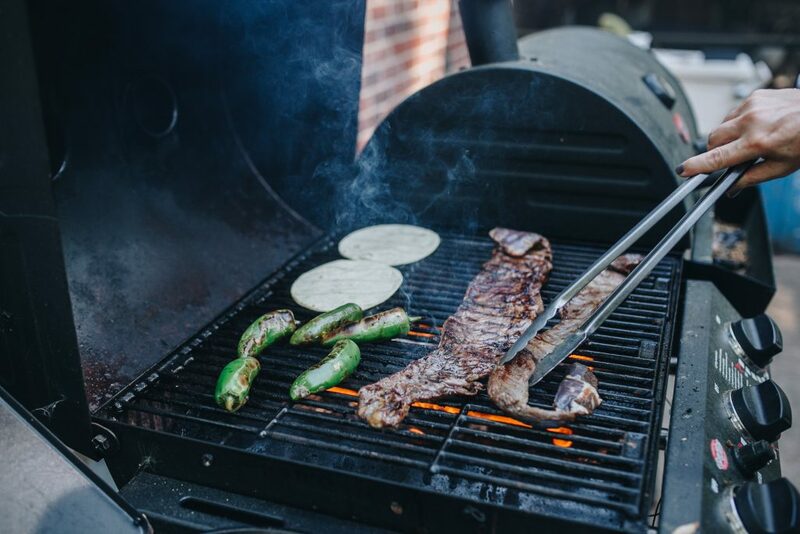 You can also use this time to heat up any tortillas you might want right on the grill. Using tongs just heat each side of the tortilla until desired doneness and place between 2 dishcloths to keep warm. Drape spring onions and charred jalapenos on one corner of the plate. 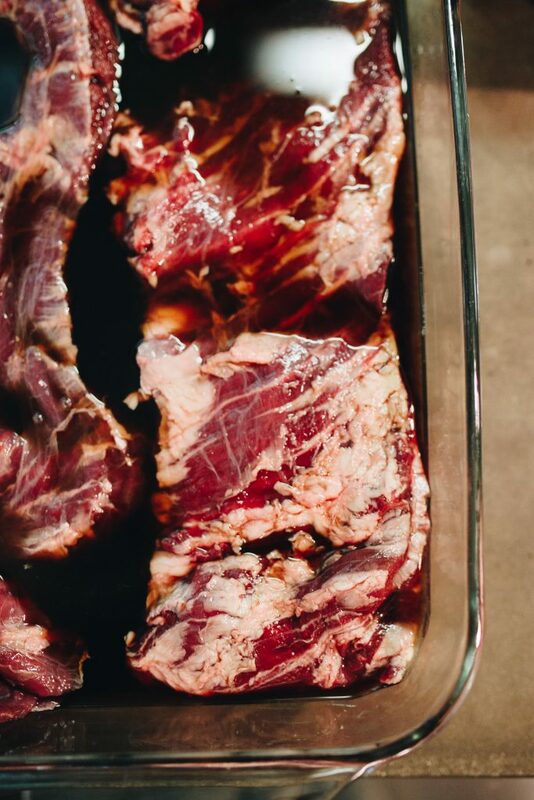 Place sliced skirt steak on the other end of the platter. 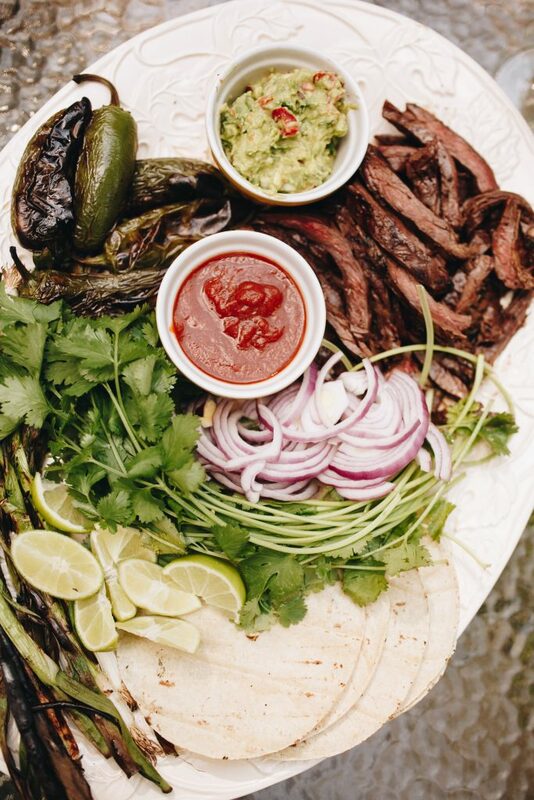 Fill in the middle with some sliced red onion, cilantro, limes, grilled tortillas, salsa and guacamole.